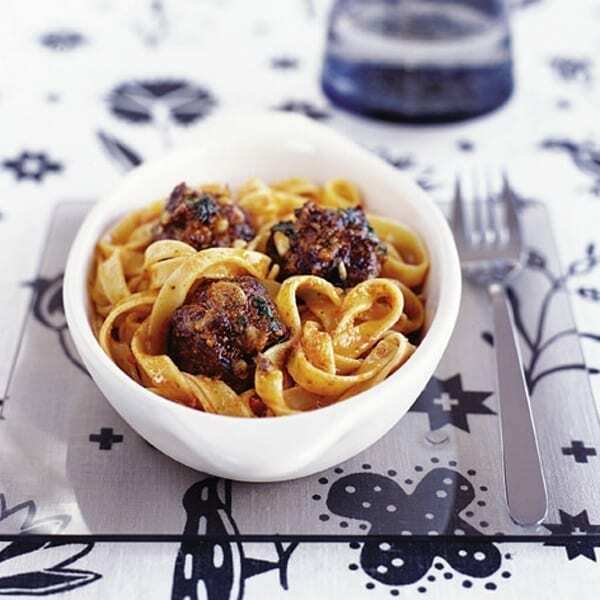 Meatballs made with the flavours of pesto – pine nuts, basil, garlic and shallots are mixed with beef mince to make this quick midweek recipe. Preheat the oven to 200C/ fan180C/gas 6. Line a large baking tray with baking paper. Put the pine nuts into a dry, non-stick pan and toast over a high heat for 1-2 minutes, tossing continuously, until golden brown. Spill onto a chopping board and leave to cool slightly. Chop roughly and set aside. Put the mince in a large bowl and season well. Add the pine nuts, garlic, shallots and basil. Use your hands to squeeze the mixture together, then roll into about 24 walnut-sized balls. Place on the lined tray and bake for 15 minutes, until cooked through. Meanwhile, bring a large pan of salted water to the boil, add the pasta and cook according to packet instructions. Drain, reserving some of the liquid. Return the pasta to the pan and stir in the pesto and a little of the reserved liquid. Season, toss the meatballs into the pasta and serve.